Karen was raised in southern California and understands the value of an In-N- Out Burger. 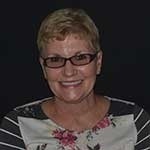 She graduated from Citrus Community College in Glendora, CA and has over 35 years of experience in Accounting and Operations and IT Management. She joined the RCI Team in 2004 and has kept the accounting records in order and the computer systems running smoothly since then. Karen is constantly snacking and is usually making lunch plans before 9am every day! But, since she never sits still, those calories never catch up with her. Karen is an advocate for Cystic Fibrosis and loves spending time with her family, especially her twin granddaughters, when she is not working.